Last Thursday I went to Antwerp. Hotel de Witte Lelie gave us the opportunity to sleep at their new, renovated room. And I can tell you, it was amazing! A large bathroom with an amazing shower in the middle of the bathroom. Freedom all around you! Unfortunately I had to hurry the next morning, otherwise I probably stayed there for at least an hour. All the staff is very friendly, and helpfull. Just like I told you before; they give you that ultimate “coming home feeling”. When we arrived at the hotel, and admired the hotel room, we went to “Dock’s cafe”. A restaurant with a household feeling. Not very chic, but comfi it was! I couldn’t hide the picture from you of the dessert (a hot chocolate cake with vanilla ice cream) simple, but delicious. And as promised, finally pictures of my Celine Phantom bag. I love it. 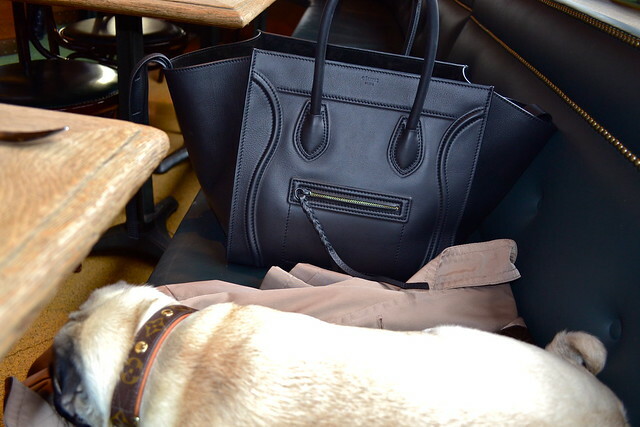 It’s amazing how the brand Celine has such beautiful products, with a lot of “less is more”! Besides, in the meantime I bought a Celine wallet and shoes as well. Kinda becoming obsessed. Enjoy the first part of Antwerp! Last Friday, Niels, Dwain and I, went to Paris for some shopping. Last time in November we said to each other that we should be back in 6 months in the city of love. We went by car, at 6 o clock in the morning. And lucky me, I could sleep at the back seats of the car. After a lot of traffic jam, we arrived at 11.30. We started the day immediately with some shopping. And FINALLY I had the chance to buy a new bag, which was a present for my birthday from my parents. After a long time doubt, I chose for the Celine Luggage bag. (Pics coming soon). The Hotel we stayed at was the “Sofitel La Defense”. Just like last year. It’s a 5 star business hotel, with very friendly staff, and an amazing shower in the bathroom. (I’m kinda obsessed with those rain-showers). After all the shopping, we went for dinner at the restaurant I really wanted to go to. “Restaurant L’Avenue” at the “Avenue Montaigne” which is near to all the shops. They had the best salmon, and the dessert was kinda unexpected too. I love frozen yoghurt, which was part of the dessert list. Conclusion: A great restaurant, with a great atmosphere, and amazing food. After dinner, we wanted to end the day with a cocktail at Hotel Costes. They had an incredible list with different cocktails, but we chose the “Hotel Costes Secret”. In fact, I still can’t tell what it contents, but I guess it was a lot of vodka.